Facebook today released some stats trying to show the success of several of the Open Graph music applications launched at f8. Most of the stats were in percentages, though, which can give a rosy impression of what is actually fairly little growth. For example, it cites that Rdio has seen a “30x increase in new user registrations from Facebook” In reality, the app itself now has grown by just 200 users to reach a tiny 4,000 daily Facebook-logged in users. While Facebook may want it to appear that all its music partners are succeeding, it’s actually a winner-takes-all scenario with Spotify far in the lead with 2.4 million daily active users. Here we’ll look at AppData‘s stats on the absolute growth of these music apps in terms of daily and monthly Facebook-logged in users. 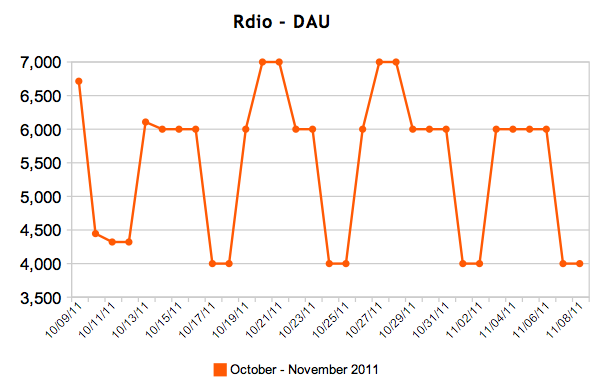 They show that Earbits, MOG, and Rdio all have a DAU of 10,000 or less. To give you some context, the top 100 Facebook apps and games have over 500,000 DAU and over 3 million MAU. Spotify is the 21st largest app by DAU, while MOG is tied for #1356th. Facebook’s right about one thing. Several music apps that provide services other than personal listening are doing quite well. RootMusic’s BandPage has 1.4 million DAU, ReverbNation’s Band Profile has 690,000 DAU, and Vevo for Artists has 250,000 DAU. Spotify – Daily active users are up 1.33 million to 2.4 million, and Spotify monthly active users are up 3.98 million to 7.4 million. Facebook listed Spotify as growing by 4 million new Facebook users. The app is becoming a habit for many, with 32% of monthly users engaging with it each day. Spotify’s overwhelming presence in the Ticker is drowning out the rest of the apps and making it seem like you’re on it with the cool kids, or you’re listening alone in the corner. Earbits – Starting from zero, Earbits now has 1,000 DAU and 10,000 MAU. Considering the potential audience and how much Spotify has grown, these numbers are not impressive. Stickyness, or the DAU divided by MAU that indicates whether or not users are consistently coming back , is 10% which is at least better than most of the other music apps. MOG – As of f8, MOG had 3,000 DAU and 32,000 MAU. It has clawed its way up 7,000 DAU to 10,000 and 137,000 MAU to 170,0000. Stickyness is the lowest of any the apps we sample, at 5.8%. MOG could have become a serious contender, but was slow to gets its Facebook integration humming immediately allowing Spotify to surge ahead. Facebook’s quote of it 246 percent growth is misleading. Rdio – Strong out the gates, Rdio was the only app other than Spotify that I saw in my Ticker right after f8. It spiked from 3,848 DAU to 8,000 in the first two days after f8. However, it has since fallen all the way back to 4,000 DAU, an increase of less than 200 users, and only spiking as high as 6,000 DAU on weekends. MAU is up from 23,800 to 60,000, but just 6.6% of users return each day. This is a much more grim assessment than Facebook saying Rdio has had a “30x increase in new user registrations from Facebook”. Unless it has significant growth of non-Facebook users, Rdio could be out of the race. Even if it does, Rdio is missing out on the Facebook virality bonanza aiding Spotify. The massive growth of Spotify and the meager increases of the other apps reflect a peer pressure effect. Before the Facebook integration, users might have explored the different apps and found the one with the content library and features that best suited them. Now it’s hard to rationalize using MOG or Rdio while constantly bombarded with Ticker stories showing that your friends are all on Spotify. While social services can provide an outlet for self-expression, they can also lead users to be implicitly bullied into conformity by the actions of their friends.